LONDON--(BUSINESS WIRE)--A renowned market intelligence solutions provider, Infiniti Research, has recently announced the completion of their latest brand strategy engagement for a chemical manufacturer. The study highlights how the client was able to build a unique identity that differentiated their brand from the competitors. Distinguish your business from your competitors with Infiniti’s brand strategy engagement? Get in touch with our experts! Improve your company’s overall position in the market by leveraging Infiniti’s brand strategy engagement, Request a free proposal! Wondering how your business can benefit from Infiniti’s brand strategy engagement? Request more information from our experts! Interested in achieving high growth for your business? Request a free proposal to know how our brand strategy engagement can help you with the necessary insights. 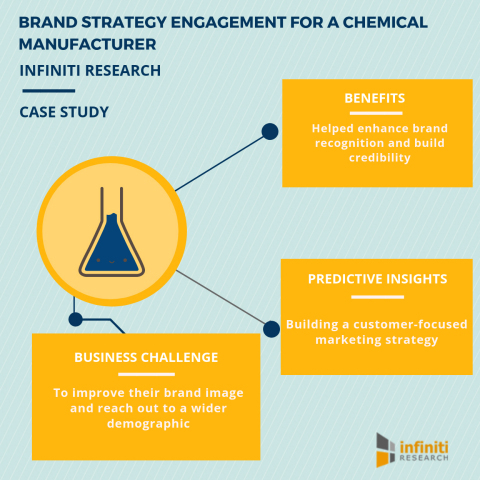 Infiniti Research has announced the completion of their latest brand strategy engagement for a chemical manufacturer.